Our house needs some serious work, like the last place we lived in, in Brisbane. 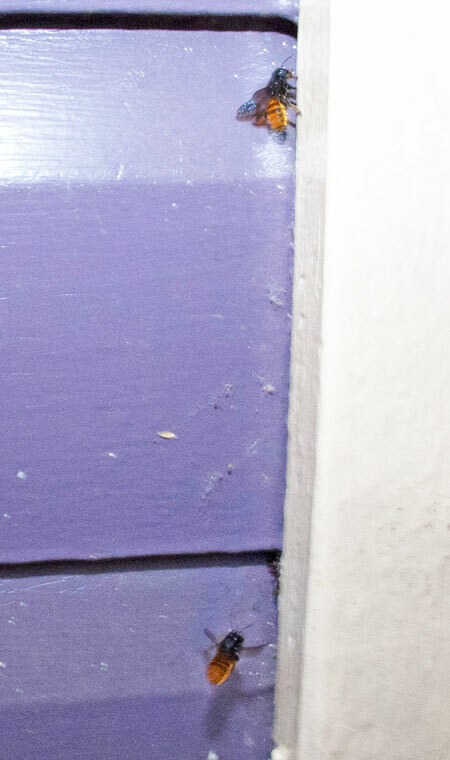 While preparing to tackle the herculean task (for me, anyway) of sanding and painting the entire exterior of the latter dwelling, an old workers’ cottage, I discovered some weird little orange bees living in gaps in the weatherboards. 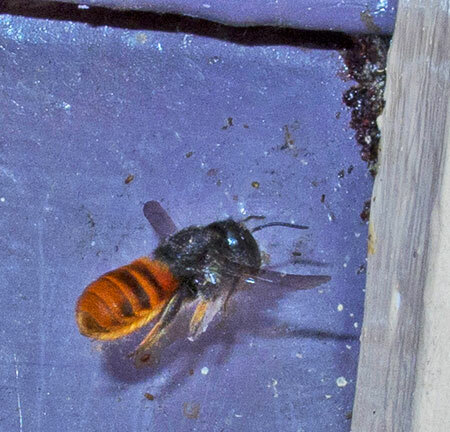 I eventually captured one, and we had it identified as a Fire-tailed Resin Bee (Megachile mystacaena). A photograph I took of it (below) ended up in the Queensland Museum’s Wildlife of Greater Brisbane in 1995, and it’s still there in the 2007 edition, on page 166. 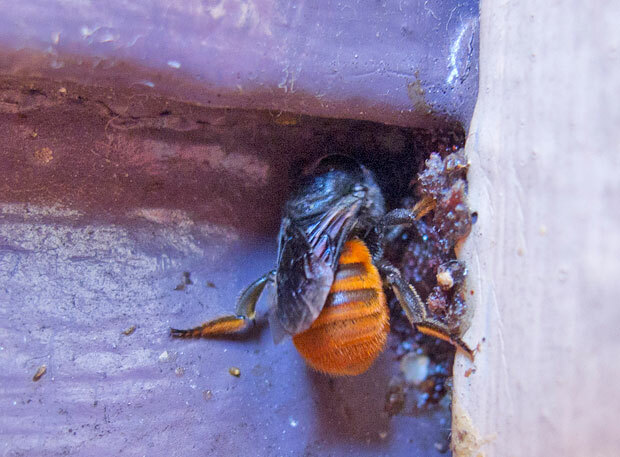 We’ve just re-discovered them busily making renovations on the verandah of our house at Toowoomba, after our dog Pluto (not much bigger than a bee, so it sees things like this as a threat) chased one around in circles. After Harry managed to get some great images I mucked about in the heat lying on the verandah with a Canon G12 and external flash for hours trying to get a few decent shots. What a gorgeous insect! 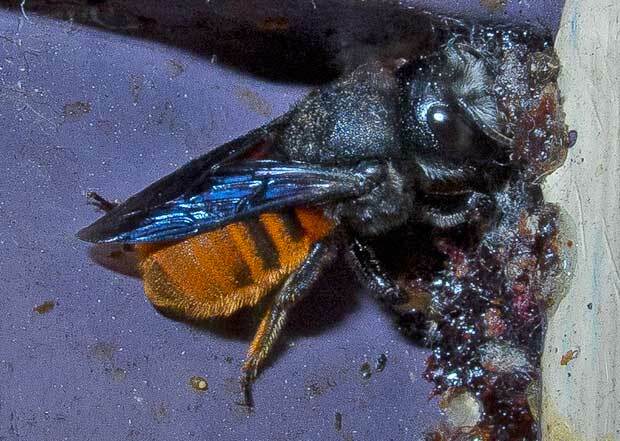 The fiery tail of the Fire-tailed Resin Bee. Photo R. Ashdown. 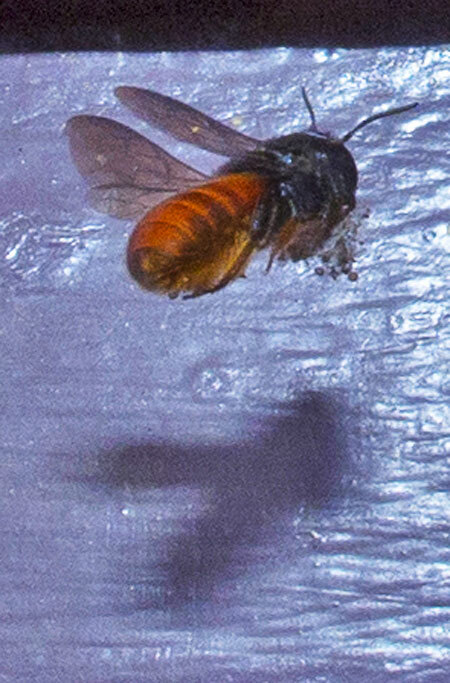 One bee worked furiously, and it seemed to be near the point of finishing one resin cell. The female bee constructs cells from plant resin, chewed plant material and mud, which she carries and moulds with her jaws. Photo R. Ashdown. 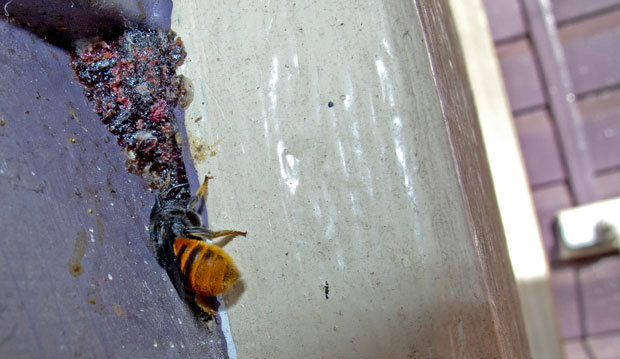 A second bee arrived (top, in photo below), and busily checked out crevices all over the verandah. One bee returning to nearly-completed cell, a second examining all the gaps. Photo R. Ashdown. Harry captured this lovely close-up showing the fine golden hairs on legs and abdomen. Photo Harry Ashdown. Bee arriving with a mouth-full of cottony plant material. Photo R. Ashdown. 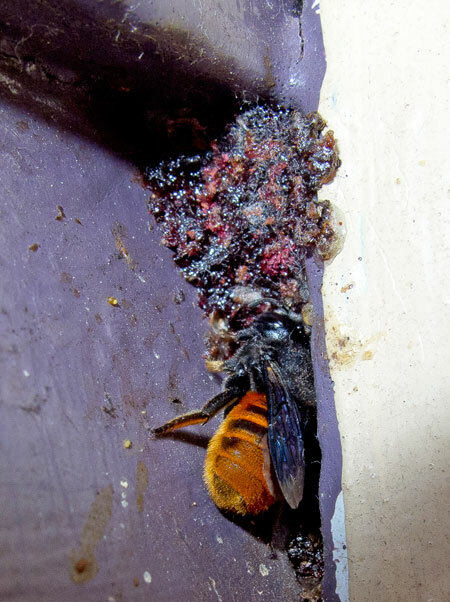 While they would arrive with what looked like white cotton wool in their mouths (see above), the resin these bees produced had a beautiful deep maroon colour. The deep red resin of a nearly-completed cell. I can only assume that the female has carried a caterpillar here that contains an egg, or eggs, of hers. The bee larvae, once hatched, will hatch and devour the caterpillar (or other prey insect). Photo R. Ashdown. These bees are a surprisingly common subject for photographers, with numerous sites showing images of these bees. 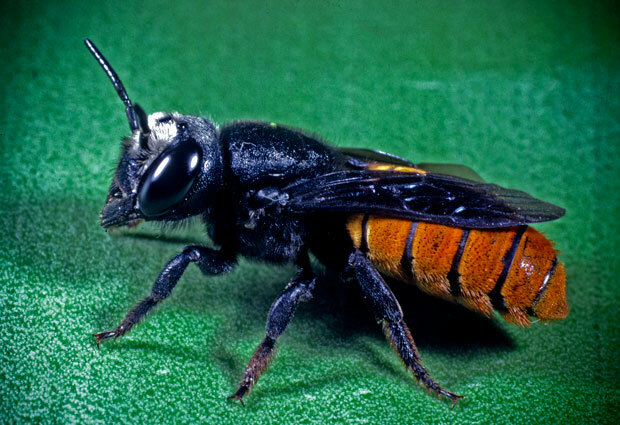 The Fire-tailed Resin Bee is just one of over 1,500 species of native bees in Australia. Many Australian these bees are solitary nesters, while others may share a nest. Others are fully social species. Although some bees sting, they are not considered to be pests as they play an important role in the Australian environment as key pollinators of many native plant species. Indigenous people have long used both the honey and the nests of native bees as valuable sources of food and wax. Commercially, the introduced Honey Bee is vital to the production of honey, but the cultivation of native bee species is also being investigated as a viable industry. Kin Kin native bees. Check out the amazing nest boxes for native bees these guys make! Sensational. Doug Beckers’ photos of a Fire-tailed Resin Bee nest with bee larvae found in the fold of his drizabone coat. This entry was posted on January 12, 2012 by Robert Ashdown.